Hope you all had a lovely Christmas, our was a bit hectic with trying to stop the kittens demolishing the Christmas Tree !! 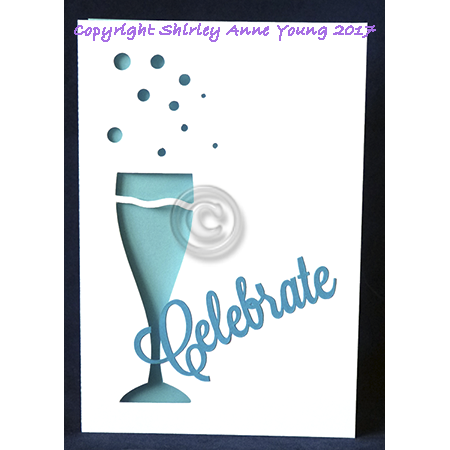 I have a freebie card for you to help celebrate special occasions, I just cut it out and added a coloured insert but you could easily make it in to a shaker card by adding acetate to the back of the glass shape and filling with sequins or glitter. Hope you like it and I wish you all a very Happy 2018. Thanks, Shirley, for creating and sharing this card. I can see using it for more than New Years. Happy New Years to you and yours!! Love it! Thanks for sharing Shirley! Our son had issues with his cat getting in their tree...he broke a few ornaments. Happy New Year to you! Great card! Thank you and Happy New Year. Thank you once again Shirley. What a lovely useful card to start the year, this can be used for so many occasions through the year I can see it becoming a favourite very quickly. Thank you for all your work, and wishing you a happy new year. Thank you for the new design. Love it! Thank you for this lovely card. Wishing you a very happy 2018! This is wonderful Shirley and will cover a lot of occasions. Thank you so much for your generosity. I swear you can see inside my mind !! I was just about to start my New Year card and your file showed up. Perfect !! Love it. Thank you. Hugs and happy new year to you and yours. Thank you Shirley for sharing this lovely card with us. It will come in very handy. Thank you so much for all the cards you share with us, Hope you have a wonderful New Year. Very useful file, will be using it for an anniversary card that I have to make. Thank you so much. Very happy year 2018 and thank you for all the cards you are sharing with us ! Thankyou Shirley. Its lovely. Wishing you and yours a very happy and healthy New year. Thank you for the cut card file. I too spent the holidays trying to keep a kitty out of my tree. We only put a few things up to see how it would go. Each morning something would be on the floor and a branch on my tree not hanging correctly. Or he would actually pull the bulb from the socket on the tree. Got to love them though! Happy New Year to you!! Thanks for all you do. I love the simplicity of this! Thank you. This is really cute! Thanks so much!